Ready to erupt your own volcano ?? Here you will find many models for every skill level. Select from the options on the right to continue. Be sure to send us pictures (or YouTube Video!) of your volcano models to post!! They are very useful because by simulating collapses you can see features in 3-D and compare them with real examples, a very clear picture of the caldera geometry can be made! How can you make a sand box model? This one is the most 'realistic' because it simulates the case of caldera collapse after a large ignimbrite eruption empties the magma chamber. How do we use these results to understand calderas? The results bring important issues related to location of faults, their development in time and their geometry. This knowledge could be used to understand geometries on old eroded calderas (cauldrons), “younger” calderas <10000 ka or very new (active) ones like Yellowstone. The classification of the five main calderas types (downsag, piston, funnel, piecemeal, trapdoor) do not examine: (a) the structure of calderas (particularly the nature of the caldera's bounding faults); and (b) how this is achieved (including the genetic relationships among the five caldera types). The first part of this study reviews these experiments, which induce collapse as a result of underpressure or overpressure within the chamber analogue. The experiments simulating overpressure display consistent results, but the experimental depressions require an exceptional amount of doming, seldom observed in nature, to form; therefore, these experiments are not appropriate to understand the structure and formation of most natural calderas. The experiments simulating underpressure reveal a consistent scenario for caldera structure and development, regardless of their different boundary conditions. These show that complete collapse proceeds through four main stages, proportional to the amount of subsidence, progressively characterized by: (1) downsag; (2) reverse ring fault; (3) peripheral downsag; (4) peripheral normal ring fault. The second part of this study verifies the possibility that these latter calderas constitute a suitable analogue to nature and consists of a comprehensive comparison of the underpressure experiments to natural calderas. The general relationship between the evolutionary stage of a caldera and its d/s (diameter/subsidence) ratio allows such quantification, with stage 1 calderas characterized by d/sN40, stage 2 by 18bd/sb40, stage 3 by 14bd/sb18 and stage 4 by d/sb14. The four stages adequately explain the architecture and development of the established caldera end-members along a continuum, where one or more end-members (downsag, piston, funnel, piecemeal, trapdoor) may correspond to a specific stage. This page was created as part of the OSU Volcanology 2010 class by Rodrigo Iriartea. An scaled model is a very suitable way to understand a phenomena. By simple observation of a scaled model we will get an idea about size, time, struture, evolution and regional influence of a complex system like a caldera could be. Even though temperature, ductile crust (overlaying the magma chamber ) cunduit feeding a vent and extruding magma can not be simulated (Acodella, 2007), the modeling shows structural features very accurately, becoming a very useful tool in vulcanology, as a way to understand and forecast possible future caldera hazards and also as a guide in economic ores explorations, since hydrothermal solutions may use the colapse caldera-faults to mineralize the host rocks (e.g. the Yerington mine Einaudi and Dilles, 2010; also Lipman, 1984). The objective of this paper is to highlight the structural features in the caldera collapse modeling, its relationship with real calderas and the role of regional tectonic enviroment. The later as an crucial factor in the final caldera collapse style. Shields are another common type of volcanic landform. They have gentle slopes relative to stratovolcanoes. Construction of a model of a shield follows the same basic steps as the model for stratovolcanoes. The piece of cardboard will be the base of the volcano. Tape a film canister near the center. The vial will be the lava pond or magma conduit . The interior of your volcano will be made of newspaper wrapped in tape. Make balls from the newspaper. You will need balls of different sizes. Use the balls to shape your volcano. 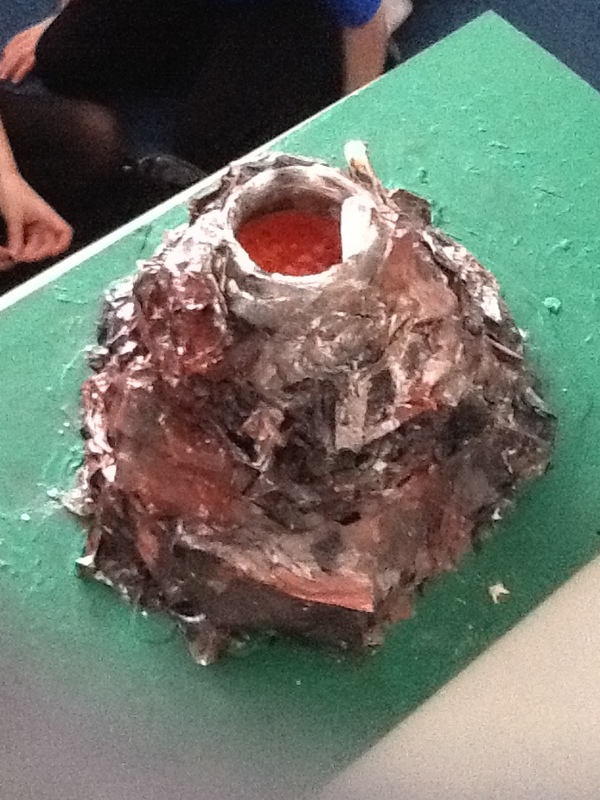 Wrap the surface of the volcano with aluminum foil. Tape the foil to the bottom of the cardboard. Gently cut the foil above the vial. Take your model outside and paint it. Photo by Christopher Milford. To make your model look more volcanic add a coat of spray glue and sprinkle sand over the volcano. You can paint the sand black if you wish. You can add several layers. Photo by Christopher Milford. This model is of a shield volcano . Shield volcanoes, like Kilauea and Mauna Loa in Hawaii, have gentle slopes. They have gentle slopes because they erupt very fluid lava that travels far from the vent . The piece of cardboard will be the base of the volcano . Tape the vial near the center. The vial will be the lava pond or magma conduit . 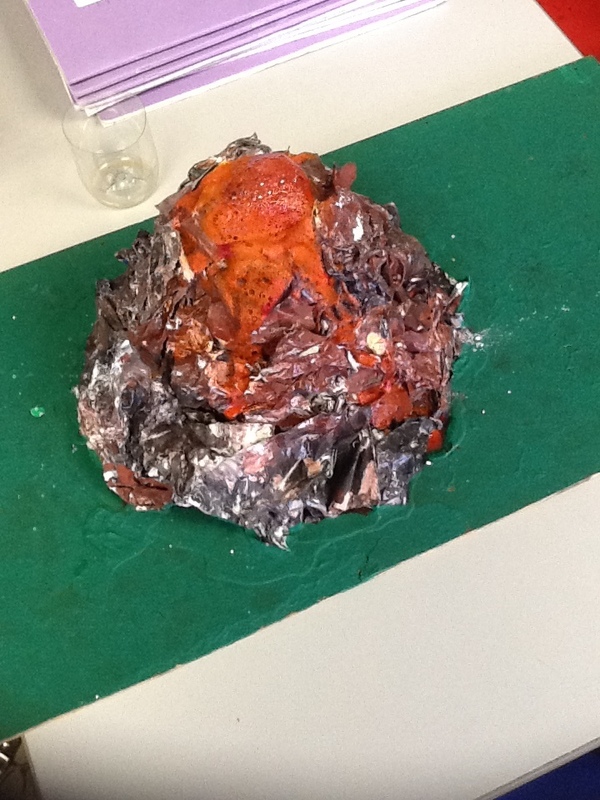 Wrap the surface of the volcano in aluminum foil. Tape the foil to the bottom of the cardboard. Gently cut the foil above the vial. A pencil is useful to hold the center of the foil over the center of your volcano. To make your model look more volcanic, add a coat of spray glue and sprinkle sand over the volcano. You can paint the sand black if you wish. You can add several layers. Photo by Christopher Milford. 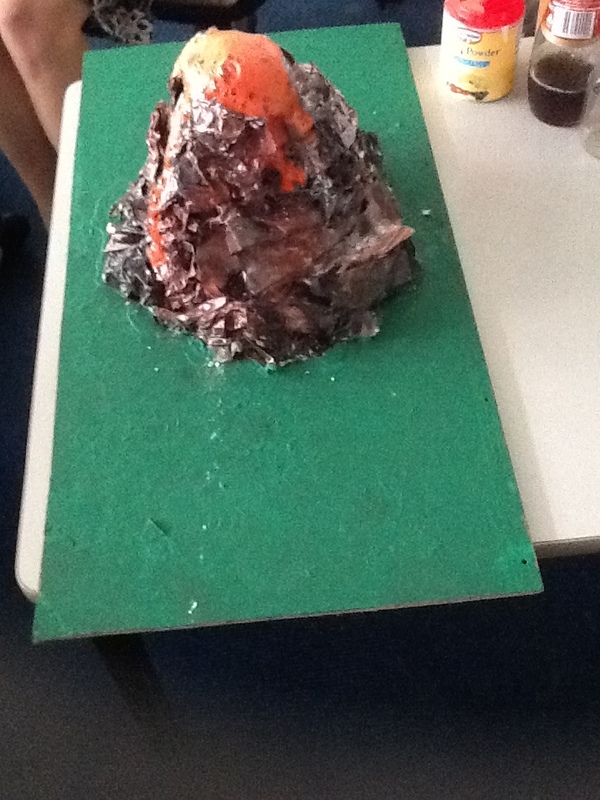 This model is of a stratovolcano . Stratovolcanoes, like Mt. Hood in Oregon and Mt. Adams and Mt. St. Helensin Washington have moderate to steep slopes because they erupt sticky lava that does not travel far from the vent and ash. First, get a pair of scissors and some glue or tape. Then print this page by clicking the "Print" button in your web browser (or click the "File" menu, and then select the "Print" option). Instructions for assembling the model will be on your printout. Created by Alpha and Gordon, U.S. Geological Survey Open-File Report 91-115. The simplest and safest way to model an eruption is to mix vinegar, baking soda and a few drops of dish soap. We made two modifications. We added red food coloring to the vinegar to give the fluid more lava -like appearance. We also added alka seltzer (crushed and mixed in with the baking soda). The alka seltzer probably wasn't worth the trouble/cost but, as the red mixture bubbled away down in the vial, our thoughts did drift to the lava ponds we have seen. Calderas and craters are common volcanic features. This simple demonstration conveys many of the concepts about how these features form. Line the box with newspaper. Punch a hole through the center of the bottom of the box and the newspaper. Pass the tubing through the hole. Tape the balloon to the tubing. Blow through the tubing to inflate the balloon to a few inches in diameter. Clamp off the plastic tubing. Bury the balloon under a cone of flour. Sculpt the flour into the shape of your favorite volcano . This teacher is making her favorite Alaskan stratovolcano . The gas pressure in the balloon holds up the top of the cone. In volcanoes the gas dissolved in the magma exerts pressure on the surrounding rocks. For most of the history of the volcano the pressure is great enough to hold up the summit of the volcano. Open the clamp and let the balloon deflate. The flour at the top of the cone collapses because there is not enough force to hold it up. In volcanoes, a large ash eruption or removal of magma to a deeper level reduces the pressure and causes the rocks at the summit to collapse. A large collapse associated with an eruption forms a caldera. A smaller collapse associated with removal of magma to a deeper level forms a pit crater . Note: this demo shows a crater or caldera forming at the summit of a stratovolcano. To demonstrate how pit craters form on shield volcanoes use a smaller box and enough flour to make the surface almost horizontal. size of the collapse feature is related to the amount pressure released. water vapor, sulfur dioxide, and carbon dioxide, not air, are the common volcanic gases. Steve Mattox wishes to thank the participants in Volcanology for Earth Science Teachers for sharing their ideas and enthusiasm. Three-dimensional cardboard volcanoes require more work but the results are more realistic. They require some knowledge of topographic maps. Because the construction of this model requires the use of a razor-blade knife it may not be appropriate for elementary school students. Mount St. Helens. Photograph courtesy of U.S. Geological Survey. Topographic maps are available for all the volcanoes in the United States. They can be ordered from the U.S. Geological Survey. Many local bookstores and outdoor recreation stores also sell topographic maps. The model made below is from a map published in U.S. Geological Survey Professional Paper 1250 about Mount St. Helens. Click here for a simplified topographic map of Mount Saint Helens. The map shows the volcano after 1980 eruption but before major dome building episodes. Your model could also be made of a favorite volcano or the one that is closest to your home or school. Step 2. Creating a Pattern. Print the page with the simplified topographic map. This photo shows the original topographic map with specific contours lines (lines of equal elevation) highlighted. The highlighted lines will serve as a simplified topographic map. If you are making your own pattern it is best to make it about 9 or 12 inches on a side. It can be square or rectangular. If needed, enlarge the map to the appropriate size. Step 3. Cutting Layers. The number of layers (pieces of cardboard) to your volcano depends on the scale (contour interval) of your map and the amount of time you wish to invest in making your model. The yellow lines on the above photo are at intervals of 250 meters going up Mount St. Helens. They adequately show the shape of the mountain and will require 7 layers to be cut (one of each elevation). Stack the layers in order of descending elevation. By the time you are done you will cut out a pattern for each elevation, trace it on the cardboard, cut it out and stack it. You'll be tired of cutting out cardboard!. Tape or glue the layers in the appropriate (descending elevation) order. Label the elevation of each layer. Vertical aerial photograph of Mount St. Helens. Courtesy of Washington Department of Natural Resources. Notice the crater and the major river valleys cut into the volcano. Compare your model to actual photos of Mount St. Helens. Compare your 3-D map to the original simplified topographic map. We took a small cardboard box (18"x18"X4") and glued a paper towel dowel to the back of the box. The dowel has a beveled cut to help the flow go in the right direction. We cut it to be about 10" tall. After this, the children rolled up scrap sheets of paper that we had saved from the computer for them to draw on. We started with big wads of paper and built a good base by using ordinary school glue to keep the pieces stuck together. Then we filled in with little wads until we had formed a half mountain coming down the dowel. Our mom made the play dough recipe (below) separating a small amount with red dye and a larger amount with green dye. When the larger amount had cooled somewhat, we rolled it out into a fairly thin sheet (not too thin) and draped it over the paper wads until the entire semi- volcano was covered. We had to patch some places. It give a great rough mountainous surface. We then spray painted some brown paint lightly over the green play dough. When this dried, we made small green trees out of the remaining play dough. With the red play dough we made lava flows going down the " crater ." On the back side of the volcano, we put a sign explaining what kind of volcano we made. It also had a cut-away view of the inside of the volcano colored by us. At school, we filled the dowel with baking soda. We had put a mix of green and red food coloring in the vinegar and poured it into the tube. Mix together and cook over medium heat until doughy. Stir constantly. Wrap in foil, knead and store. Omni Resources (1-800-742-2677) sells raised relief maps of Mt. Rainier (12 x 18", $8.95), Yellowstone (18x25", $10.95), Naples (Vesuvius)(2x3', $69.95), Catania (Mt. Etna)(2x3', $69.95), and Reunion (27x23", $49.95). A raised relief map shows shape and size of a volcano without any distortion. This photo shows a raised relief map for the island of Hawaii. The rifts zones of Kilauea and Mauna Loa volcanoes are highlighted with silver tape. In Hawaii eruptions originate at the summit or along the rift zones of the volcano. Purchase (or make) a relief map of a volcano that is of interest to you (perhaps a well known volcano or one near your home or school. Molasses is a good substitute for lava. It is more viscous (stickier) than water and will move slowly down the map. Place the map on a table or on the floor. Stand or sit next to it. Place the straw in the molasses and put your thumb over the top of the straw so the molasses stays in the straw. Move the straw over to the relief map. Take your thumb off the top of the straw so the molasses pours out. Gravity will pull the molasses down slope just like it pulls lava down the slope of the volcano. This simple model can demonstrate the factors that influence where lava will flow. For example, start your eruptions at the summit or high or low on a rift zone. Vary the amount of lava erupted (one straw full versus several straws). Vary the duration of the eruption (empty the straw at intervals of 5 seconds). Vary the slope of the volcano (lava moves faster on steep slopes). Can you predict what eruption conditions are needed to reach a specific location on your map? Compare you lava flows and relief map to known historic lava flows for the volcano you are interested it. The U.S. Geological Survey's Cascade Volcano Observatory provides detailed histories on each Cascade volcano. Do the flows on your map resemble any of the known historic lava flows? If they do what were the conditions during that eruption? Not all volcanoes erupt fluid lava flows that travel far from the vent . Some volcanoes produce fluid mudflows that do travel far down the volcano. This demonstration could be easily modified to show areas that are susceptible to mudflows on a volcano. Submitted pictures and videos of your volcano models are posted here. Picture 1: Set up of the volcano. Picture 2: An erupting volcano! We present instructions for the safe demonstration of an explosive volcanic eruption. In less than a second, the explosion carries up to 20 gallons of water into an eruption column more than 10 meters high. Boiling liquid nitrogen encased in a plastic soda bottle provides the driving force for the explosion. The demonstration is appropriate for levels ranging from elementary to graduate school and dramatically illustrates how the rapid expansion of a liquid-hosted gas can cause explosions. Students can perform quantitative calculations to describe the physical principles of the eruption, in this case, for an event they have actually witnessed. Typical example of the eruption column demonstration, taken from the 4th floor of Lathrop Hall, on the Colgate University campus. Two more examples of the eruption column demonstration. Typical Mount St. Helens-style lateral blast, using inexpensive trash can with molded sides. Eruption column spiked with red Jell-O. Eruption column made of green Jell-O. Typical soda bottle-brick-duct tape set up (left). Contractor trash can from Rubbermaid (label, on right). Most schools in the U.S. are far from active volcanoes, and few students have the opportunity to witness eruptions. Simulations of eruptive processes, or analog models, provide ways for students to visualize eruptive processes and apply basic physical principles when field observations are not feasible. In this paper, we describe a safe simulation of violent volcanic explosions, one that can be carried out simply and easily as a demonstration for specialized volcanology classes, introductory classes, and science outreach programs. Volcanic eruptions are fundamentally gas-driven phenomena. Depressurization of volatiles dissolved in magma during ascent is the driving force behind most explosive eruptions. Furthermore, phreatomagmatic eruptions result from the conversion of water to steam during magma-water interaction. During an eruption, the exsolution and expansion of gas causes ascent velocity of the magma to increase. When the volume fraction of bubbles exceeds about 80%, the magma fragments explosively and is carried by a gas stream (e.g. Sparks, 1978). We have developed a demonstration whereby the instructor can initiate a gas-driven eruption, which produces a dramatic but safe explosion and eruptive column. First, one pours liquid nitrogen into a weighted, plastic soda bottle, which is then sealed and placed into a trashcan filled with water. As the liquid nitrogen boils, the pressure inside the bottle increases until it fails, resulting in an explosion. The expansive force propels a column of water vertically, to 10 or more meters. Because liquid nitrogen is thermodynamically unstable at room temperature (boiling point at 1 atmosphere: -195.8°C), its boiling provides the pressure necessary to cause an explosion, illustrating an important process that drives real volcanic eruptions (e.g., Francis, 1993). As with most simulations, this one is imperfect. Unlike magma, the gas does not exsolve from the liquid, and consequently it is not dispersed throughout the water prior to explosive expansion. Also, there is no real transfer of heat during the eruption. Nevertheless, it is an exceedingly effective demonstration of gas-driven liquid explosions and one that is safe if done properly. Metal garbage cans are inappropriate for this demonstration, because they simply rupture along the welded seams. In most cases, we use a high-grade, plastic contractor’s trashcan (Table 1). Only two people should carry out the demonstration. They must have clothing covering their legs, arms, and feet and they must wear safety glasses and gloves throughout the process. Prior to handling any liquid nitrogen, the demonstrators should do a practice run of the entire procedure. We recommend that the two participants rehearse their roles several times until everyone is confident of their part in the demonstration process, without hesitation. Make sure the audience members remain at least 5 meters from the trashcan at all times. Fill the trashcan about 80% full of water. This is about 95 L (25 gallons), nearly 100 kg, thus the trashcan should be filled at the exact site where the explosion is to take place. The demonstration is more impressive if the trashcan is located on a horizontal paved surface, not grass, and never on a cart. Secure a 0.5 to 1 L plastic soda bottle to 1-2 bricks using duct tape around the middle of the bottle. Align the bottom of the brick(s) with the bottom of the soda bottle, so that the brick-bottle apparatus stands freely. Ensure that the weight of the brick(s) is sufficient to keep the bottle submerged by performing a practice run with an empty bottle. The sealed bottle and brick must submerge completely. Set the open bottle and attached brick upright on the ground with the funnel in it. Have one individual hold the cap, so that it can be placed on the bottle quickly. One person holds the funnel far enough out of the bottle opening to make an air outlet for the gas, otherwise boiling liquid nitrogen splashes out, and the bottle will not fill efficiently. The second person pours the liquid nitrogen through the funnel into the bottle until the bottle contains approximately 20-30 mL of liquid nitrogen (i.e., 2-5 cm depth from the bottom). The amount need not be precise, and much of the nitrogen boils away as it is poured. Time is of the essence at this point. The person holding the funnel should toss it aside and cap the bottle tightly. Be sure not to cross-thread the cap. It is critical that the cap be finger tight, so the bottle is well sealed. Within no more than 5 seconds, one of the demonstrators should pick up the bottle/brick apparatus and drop it gently in the garbage can. Try to put the bottle in the center of the can and not against a side, where it is more likely to rupture the plastic walls. After immersion of the N2(l)-filled bottle and brick, the two people performing the demonstration should walk away quickly and wait, at least 5 meters from the can. There is a delay of approximately 10-30 seconds before the explosion, so they do not need to run. The liquid nitrogen undergoes a phase change into gas. In the absence of the confining bottle, the small amount of liquid in the soda bottle would expand (at standard temperature and pressure) to well over 20 L. Because they are built to sustain overpressures from carbonated drinks, the bottle resists the expansion while pressure builds. Eventually, the bottle ruptures, and the force of the gas expansion passes into the water, resulting in an eruption column of water several meters high. The garbage can often makes an impressive jump as well. If the bottle does not explode within the anticipated 10-30 seconds, do not approach it; we have seen the rare event where the bottle is particularly strong and resists for close to a minute. If you see vapor bubbling out of the can (which is just escaping nitrogen), then there is a leak in the cap or bottle, and it may or may not explode. There is a tendency for impatience at this point, but under no circumstance should anyone approach the trashcan until they are positive that the bottle has failed and all of the N2(l) has boiled away, and then only the demonstrators (with covered shoes and safety glasses) should go to the trash can. In our experience, the most common mistake is that the cap is not put on properly, which is not a dangerous situation. At the simplest level, the eruption column demonstration illustrates gas-driven eruptions, dispelling the common misconception that there is some kind of fire or hot explosive involved in volcanic eruptions. Because the blast is short-lived, it is best to explain the procedure and its significance first, then carry out two detonations, so people can watch the second more carefully after the surprise of the first explosion. We have performed this experiment for groups as large as 500 people, provided there is an outdoor amphitheater of some kind. We routinely carry out the demonstration for students of all ages. A modification of the demonstration simulates the famous lateral blast at Mt. St. Helens on May 18, 1980. An inexpensive trashcan will usually fail along one of the molded seams, propelling some of the water laterally. a. By measuring the height of the eruption column, students can use basic physics to calculate the ejection velocity of the water propelled from the trashcan and compare the results to the velocities observed at actual volcanic eruptions. b. Using their calculated ejection velocities, students can then determine the pressure needed to propel the water column using the modified Bernoulli equation: ½ U2 = (Pi – Ps) / S, where U is the ejection velocity in m/s, Pi is the reservoir pressure (in Pascals, Pa), Ps is atmospheric pressure (Pa), and S is the magma density (the density of water in kg/m3). The students can once again compare their results to observations from real volcanic eruptions. c. Students can use the estimated volume of gaseous nitrogen in the soda bottle (via the ideal gas law) and the volume of water in the trashcan to calculate the average vesicularity prior to eruption, which they can then compare to theoretical estimates of fragmentation (Sparks, 1978). The density of N2(l) is ~0.807 g/cm3 under standard conditions. d. Styrofoam peanuts or spheres of different sizes, such as tennis balls and apples can be used to simulate ballistic pyroclasts. After the eruption, students can construct isopleth maps of the clasts. The different densities and aerodynamic shapes of the “clasts” reproduce the distributions of volcanic bombs, blocks, and cinders. e. Different vessels for the demonstration affect eruption style as well. For instance, a small rigid-sided wading pool generates a base surge and a shorter eruption column. As mentioned above, a cheap soft-sided trashcan is likely to fail along its seams, yielding a lateral blast. This simulation operates on physics similar to that which drives volcanic eruptions, but on a scale accessible to students. Furthermore, the simulation permits interaction and experimentation with the driving forces behind eruptions, more so than can be accomplished by narrative or video footage. This demonstration has repeatedly proven to impress students of volcanology ranging from first-graders to professors (including a group of high school and college physics instructors at a national physics conference). In addition to being visually impressive, it provides a safe means to illustrate and explore explosive volcanic phenomena. ¨ Industrial strength plastic garbage can (a “contractor’s” trashcan, usually ~$35-40 at most home supply stores); these are generally re-usable. Avoid small buckets or other light plastic containers, as well as metal cans; all of these will be destroyed in the blast and the metal cans will split along their seams and possibly send out shrapnel. ¨ Soda bottles (16-20 ounce size is most convenient, but the 2 L bottles are equally effective) with their caps. Water bottles generally do not yield the same magnitude eruption, because they are not as strong as soda bottles and fail before pressure builds up significantly. One bottle is needed per demonstration, and several back ups should be on hand. ¨ Use an inexpensive plastic, residential curbside trashcan with indentations in the side ($8-12; e.g., Falcon 32-gallon molded black plastic “heavy duty” can); these generally fail in the explosion, resulting in a lateral blast, but the can is obviously not reusable. Stronger cans that have been damaged or have cracks in them also work for this version of the demonstration. Beiersdorfer, R.E. and Beiersdorfer, S.I., 1995, Collaborative learning in an advanced environmental-geology course, Journal of Geoscience Education, v. 43, p. 346-351. Francis, P., Volcanoes: A Planetary Perspective (1993), Hong Kong, Oxford University Press, 443 p.
McRae, R., Rahn, J.A., Beamer, T.W., and LeBret, N., 2002, The Liquid Nitrogen Fountain, Journal of Chemical Education, v. 79, no. 10, p. 1220-1221. Nolan, W.T. and Gish, T.J., 1996, The Joys of Liquid Nitrogen, Journal of Chemical Education, v. 73, no. 7, p. 651-653. Smith, D.L, Hoersch, A.L., Gordon, P.R., 1995, Problem-based learning in the undergraduate geology classroom, Journal of Geoscience Education, v. 43, p. 385-390. Sparks, R.S.J., 1978, The dynamics of bubble formation and growth in magmas: A review and analysis, Journal of Volcanology and Geothermal Research, v. 3, p. 1-37. Young, J.A., 2003, Liquid Nitrogen, Journal of Chemical Education, v. 80, no. 10, p. 1133. We would like to thank the Colgate University “Volcano Cowboys” for their unerring dedication to refining the demonstration method, including (but not entirely limited to): David Kolodney, Adam Skarke, Jay Barr, Evan LeBon, Scott Annan, Nathan Rollins, Ashley Nagle, and Vanessa Simpson. DJG would like to thank the forgiving Secret Service agent who visited him when he performed the demonstration on the same day a supreme court justice visited campus.